A variation on longest increasing subsequence problem. A digital subsequence of D is a sequence of positive integers composed in the usual way from disjoint substrings of D. For example, '34, 5, 9, 26, 358, 9' is a digital subsequence of sequence '3, 4, 5, 9, 2, 6, 3, 5, 8, 9'. The numbers in the digital subsequence can be a combination of any form of the digits of the given sequence, as long as there is no repetition or wrong order. An increasing digital subsequence means the numbers in the digital subsequence need to be strictly increasing, and the previous example is not. A positive example is '3, 4, 5, 9, 26, 35, 89, 93, 238, 462' of length 10, generated from sequence '3, 1, 4, 1, 5, 9, 2, 6, 5, 3, 5 ,8, 9, 7, 9, 3, 2, 3, 8, 4, 6, 2, 6'. The problem is, given D, generate its longest digital subsequence. Since LIDS is known to be a variation of LIS, dynamic programming seems to be a reasonable try. The horizontal axis is now settled as the given sequence. It is important to figure out what type of values to store and reuse for dynamic programming. The difficulty here is that numbers of variant lengths can be used for the sequence. 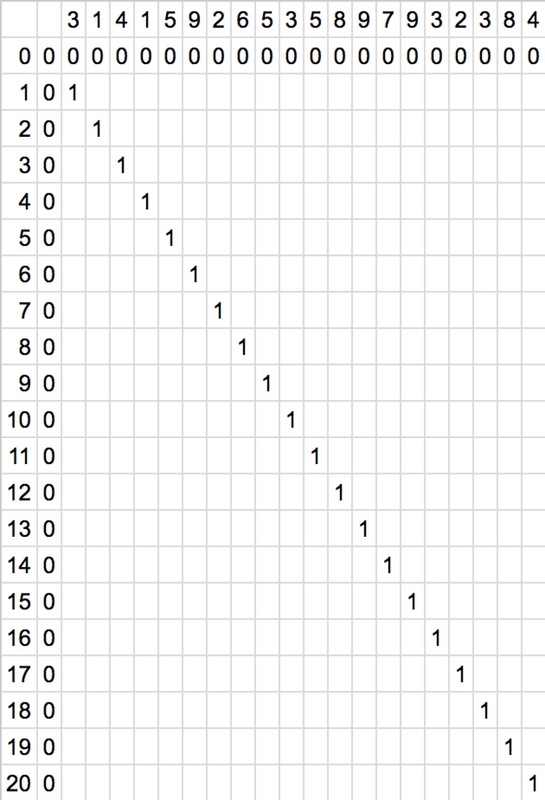 Well, this seems to be a choice for vertical axis: each row should represent the digital subsequence made from a fixed number of digits, the first row being the original sequence, and the last row being a huge number made by all the digits. Another thought comes to mind is that a subsequence is an extension of a shorter subsequence. This is the key for dynamic programming problems. Given an array A[0 ... n - 1], initialize a storage array D[0 ... n - 1] of 1's, which represents length 1 of each entry itself. Starting from A, for each element A[i], compare it with the values A[j] in A[0 ... i - 1]. If A[i] is greater than A[j], and adding this 1 extra length (D[j] + 1) is greater than its original D[i], update D[i]. The length of the LIS is max(D). But wait, for numbers with only one digit, this is perfectly fine; what about numbers with more than one digit, there are problems of corner cases and reusing digits! Well, those can be tackled individually. For the corner cases where indices run out of margin (before the diagonal), just use the number on the front line and add one to it, since a number with more digits is definitely bigger than that with digit deficit. The second problem requires a little bit thinking. First, the notation will be different here: A[1 ... n] instead of A[0 ... n - 1]. There is also an important assumption made during iteration: each entry of the row stores the maximum length of LIDS ending at its index, instead of starting from; that is, for the entry below A "9", it stores the maximum length of LIDS of sequence "3, 1, 4, 1, 5, 9". The main difference between calculating LIDS of numbers with length one and those with greater length is that the latter allow a smaller length of numbers in their subsequences. "3, 1, 4, 1, 5, 9" only allows subsequences such as "3, 4, 5, 9" for row one, but there can be "3, 4, 15" or "3, 14, 15" for row two. This requires an additional trick for updating the length values. In order to take the described situation into account, the next number needs to perform a check on the gain between treating the previous number as a whole or as a disjoint part. For example, in the case of 2-digit numbers, for number 59 in "3, 1, 4, 1, 5, 9", 59 is greater than 41, so the value of matrix M[2, 6] can add one at the base of M[2, 4] (which means length of LIDS ending at the second "1"). However, this value might be smaller than adding one to the solved subsequence "3, 1, 4, 1" with 1-digit numbers (in this example those two values are the same, so choose either one). Similar checks apply to all different lengths: 3-digit numbers should check the solved subsequence with 2-digit numbers, etc. 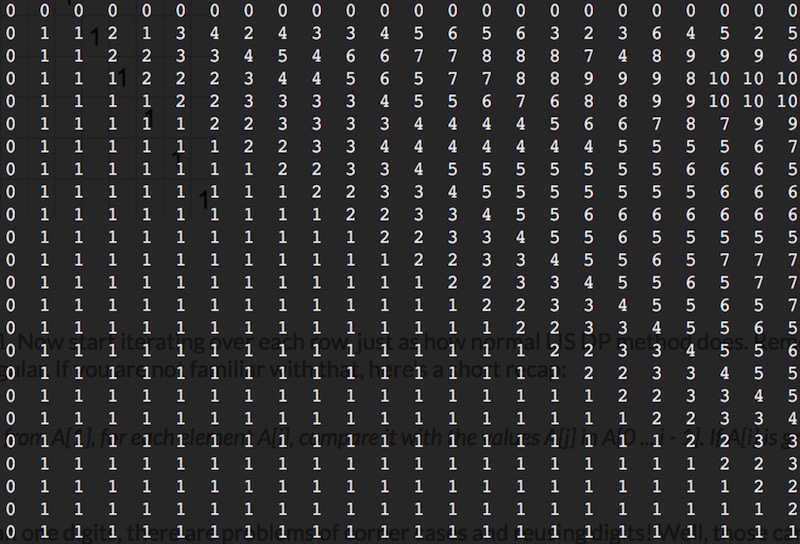 where each value M[i, j] represents the maximum length of increasing digital subsequence ending at A[j] containing the i-digit number ending with A[j], with at least one another i-digit number in the subsequence. For example, the value of M[2, 9] is 4, meaning the subsequence generated from "3, 1, 4, 1, 5, 9, 2, 6, 5" ending with 65 and containing at least one another 2-digit number has maximum length of 4, which could be "3, 4, 15, 65" or "3, 14, 15, 65". Below is the code with both calculation and backtracking: the backtrace is quite simple as long as the trajectory of the updates is recorded. Note that the result is not a complete set of all possible LIDS', just a subset. This algorithm runs in time complexity of pseudo O(n3), and space complexity of O(n2), without any optimization. Let D[1..n] be an array of digits, each an integer between 0 and 9.
the usual way from disjoint substrings of D.
This function computes the longest increasing digital subsequence of D.